“After 17 years of making TV commercials in Mumbai, I wanted to do something that reconnected me to the Earth,” says Jenny Pinto, Founder and Creative Head of Jenny Pinto Studio. Papermaking has served her to walk on that path of reconnection. She loves the look, touch and feel of beautiful paper and enjoys exploring various natural fibres for making paper. The interplay of light and paper excites her and forever finding ways to turn paper into 3-D structures, through texturing, sculpting and layering…..is more play than work for her. “I hope that the fun I have shows in my work,” she shares. 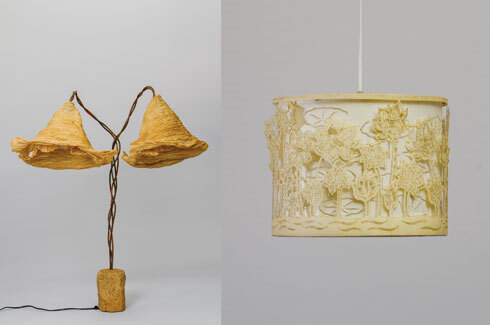 Though paper can act as the genesis of a number of products, like stationery and art, something she has also delved in, Jenny would particularly like to concentrate on lamps as she believes it’s a field that still has dimensions that she can explore. She only uses natural fibres as raw material, especially such that are discarded by agricultural and rural cottage industries. The extraction of the fibres is part of a rural cottage industry that provides income to out of work agricultural workers in the off season. 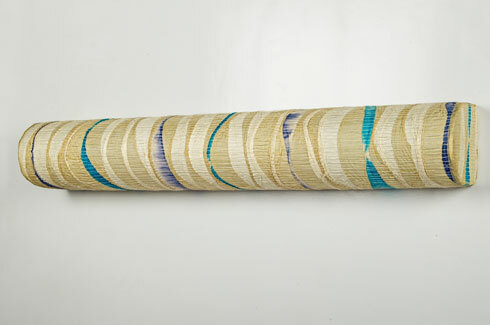 She specifically likes to use banana, mulberry, kora grass, jute and sisal fibres as they make paper which is not only beautiful but also very strong. To make the hand-made paper she uses a Hollander beater and lifts the paper with a traditional mould and deckle. “My studio in Bangalore that I built in 2002 is one of Bangalore’s first green buildings. It was designed by the innovative architect Chitra Vishwananth and her team at Biome Solutions,” reminisces Jenny. “It is constructed with mud blocks, the roof harvests rain water and we also recycle waste water from both, the papermaking process and sewage,” she adds. The recycled water is used in her garden, where she grows organic fruits and vegetables. It has been almost several years now and the house and the system is still very efficient and cost effective. 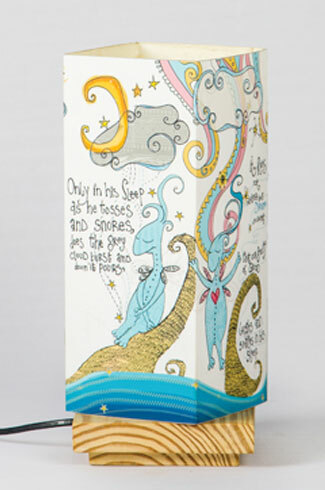 The paper she creates in her studio is used to make a range of lights, stationery and home accessories. Although she works with many fibres, banana fibre is her preferred raw material. It is the long silky fibres from the trunk of the banana tree that are her raw material of choice. The inherent strength and beauty of the paper it produces, is a delight to work with. 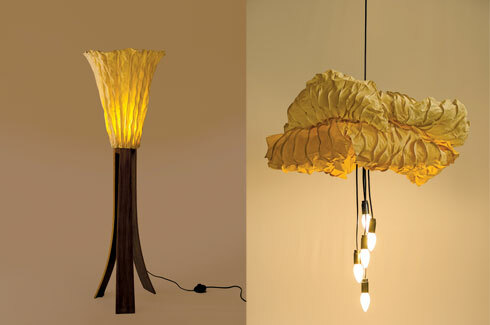 When it comes to lighting Jenny Pinto’s range of lamps are nothing short of poetry. Paper seems to invite the light in and envelopes it with warmth and sensuality. “The magic of paper and light lies in the eloquence of shadows. 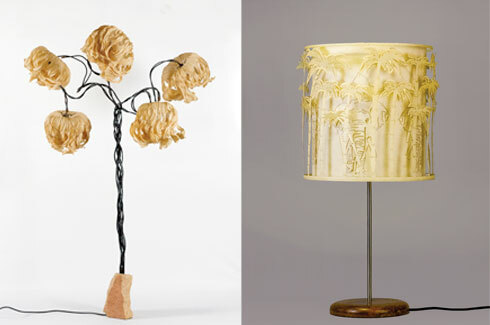 I try and create interesting shadows, both, within the paper, using various wet and dry techniques, and in the design of the lamps, books and accessories I make,” says Jenny. Besides products displayed on her website, she also does site-specific light sculptures and customised papers, books and lights. 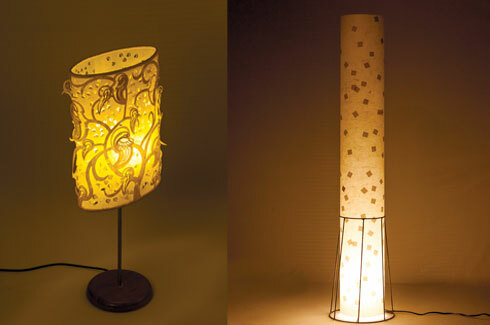 Till date Jenny has designed many paper lamps for a number of well-known clients such as Serai Resorts, Cumins Pune, Informatics, Google, Microsoft, Cafe Coffee Day, Nandos, The Park Hotel, Green Park Hotel, TCS, and many more. 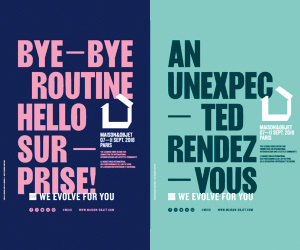 “I experiment with new fibres all the time. Both for my work as well as for the rural projects I am involved in,” concludes Jenny. From the very building the paper products are made in to the raw material and the process, a respect for the environment is seen to be the uppermost concern. 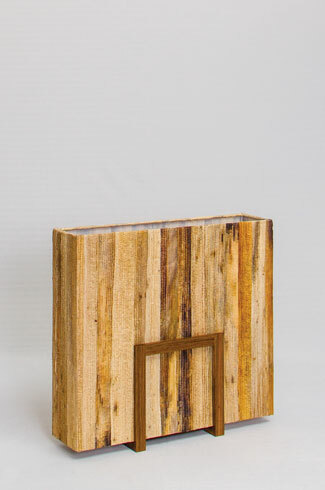 Jenny Pinto’s products are therefore truly sustainable and eco-friendly.